Stormcast Eternals: 2000+p Warrior Chamber, 1500p Vanguard Chamber, 1500 Sacrosanct Chamber; I can move heroes and some units around to have 2000p of any chamber for a game. Basically each Start Collecting plus extra units and heroes. No Extremis stuff or huge models, but might get a Stardrake some day. Blades of Khorne: 2000+p mortals + 30 Bloodletters; I'm getting a Bloodthirster for christmas. No cavalry because I don't like the cyberlook for my army. Tzeentch Arcanites: 2000+p composed of the Start collecting demons of Tzeentch set, Silver Tower and the Change cult box + a Changeling. NightHaunt: 1500+p; basically a unit of everything released so far except for Harridans and the Black Coach (though I really want one). Slaves to Darkness: 1000p The Start collecting set, a box of Marauders and Horseback Marauders plus the Darkoath Warchief and WarQueen. 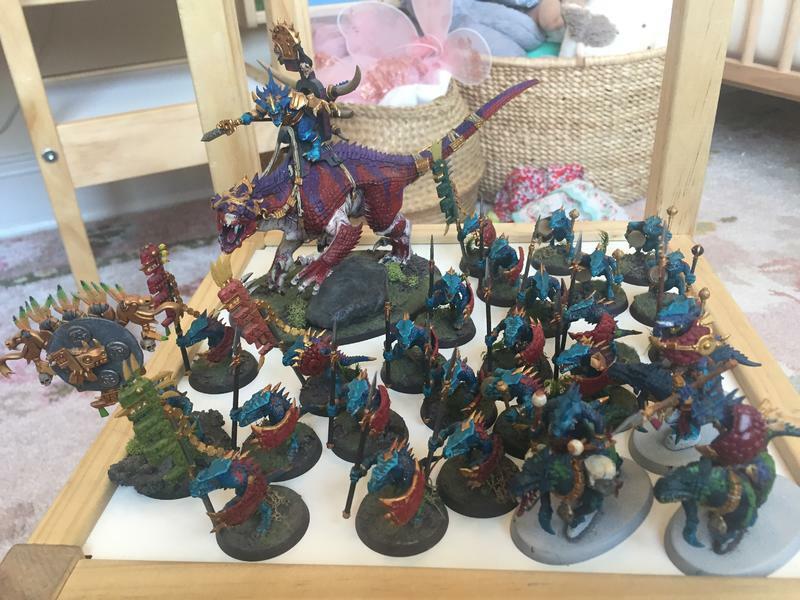 I'm one Skink Starseer away from having every Seraphon model in the range! I really like Seraphon since, in 15 years of playing GW games, this is the first army I've ever (nearly) completed. As for the Freeguild, they are my new army. The weird unit numbers come from conversions I'm making. I'm really taking my time with the painting and conversions, trying to match my head-canon. Right now the army includes mostly humans but also 3 barbarians, 3 goblins, a skeleton, 2 (a)elves, and a badger! This is the best thread ever. No really, I mean it! 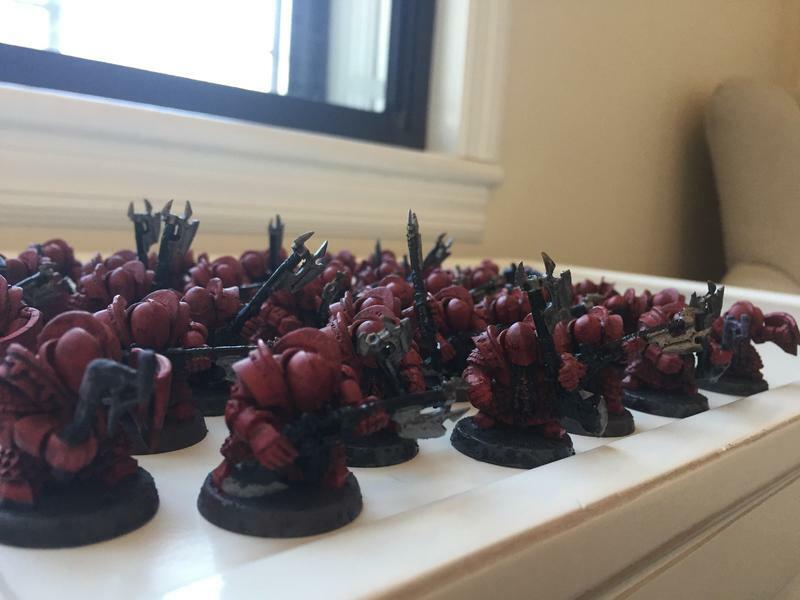 Reading these posts makes me feel better about my self, truly, because now I see that other people spend way more money on toy soldiers than I have done. ? Mostly keeping track of this for me, though I do bet I have a fairly high amount of seraphon! I just got into AoS this summer so my collection is still pretty small. It's an expensive hobby, but I've found the building and painting surprisingly fun. ...not as fun as fighting battles, but more fun than I expected. 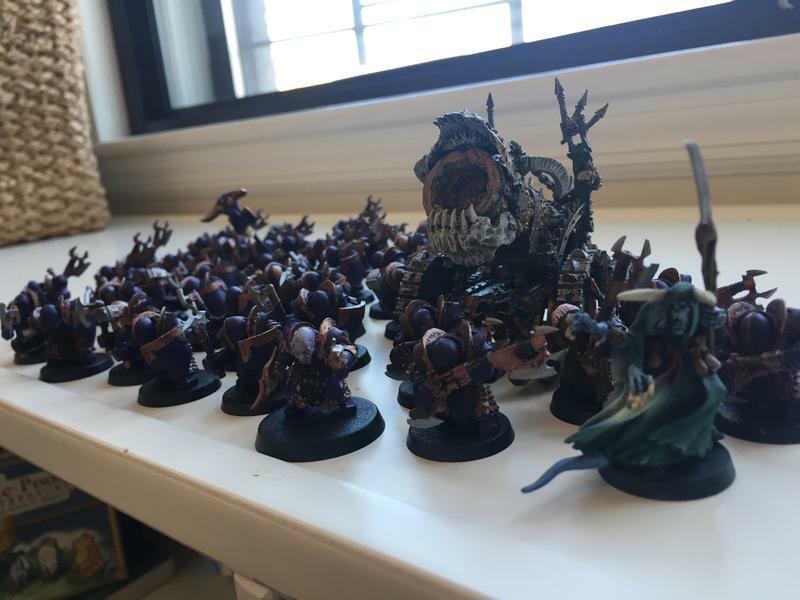 When I started with AoS I also picked up the Ironjawz since I had enjoyed the orks in Warhammer: total war. But I don't really like how they play. I much prefer the speed and hitting power of the Deepkin. Plus Aelves on sea monsters are just plain cooler models. ...I'm planning sell off my Ironjawz if I can though, so they won't be in my collection for long. I'll be adding a Elidon and probably start collecting Daughters of Khaine or shadow aelves if they come out anytime soon. I plan on focusing on Aelves since they seem to have some of the coolest models and are good combat armies (at least so far). 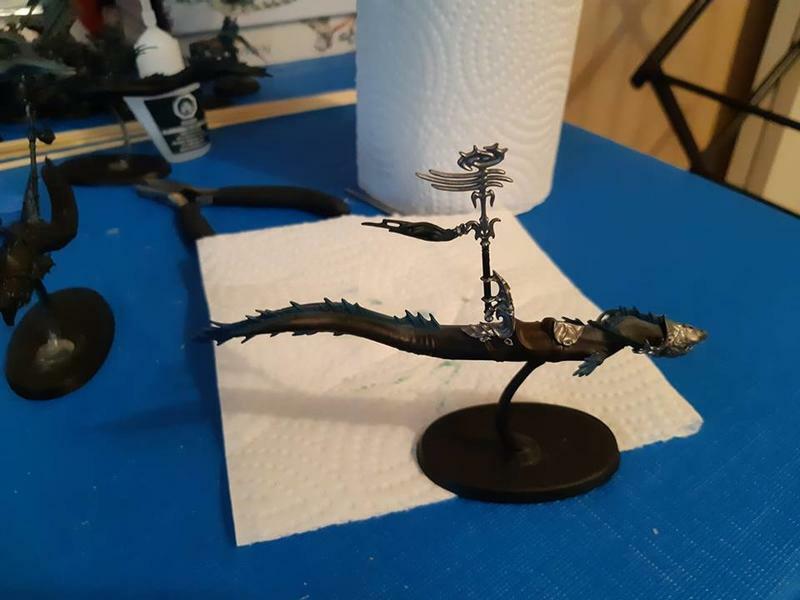 I haven't finished painting my Deepkin yet, but here is one of my eels. Very nice, everyone! Dinostar, that display case is great. @Duke of GisoreuxThat is utterly awesome! Lots more room for more artwork too on the walls! Great work and fantastic to see such a huge collection well painted and on display and so close to a board its ready to go! That is one impressive hobby room. The door is particularly awesome. 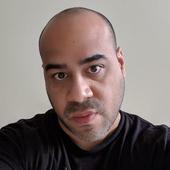 This thread should be fine to necromance a little.. This is what I have for my Soulblight army, including some allies. It feels more or less complete, although far less so in painting. I intend to start a painting log when more things come together. I also the ability to make 2 regular seeker chariots or 2 hellflayers or a fourth exalted chariot, with 2 more on the way from another SC box. I want to get a full Nighthaunt army and a full Nurgle army after that. I also need to convert some square bases into round ones. 20 liberators. 10 retributors. 10 judicators. 5 vanguard hunters. 3 pallador. 2 fulminators. Lord celestant, castellant, relictor and Neave. 40 skelli, 20 chainrasp, 20 grimghast, 10 hexwraiths, 3 spirit hosts, 5 blood knights, 2 banshees, coven throne, arkhan, necro and vampire Lord on nightmare steed. 10 thralls, 10 reavers, 12 morsarr (6 of each), allopex, leviadon, king, AoSea, Tidecaster, soulscryer, soulrender. Alarielle, treelord ancient, kurnoth, 30 driads, 10 tree revenants, branchwych and branchhwrait. 20 arkanaut company, admiral, endringginders and 2 ships (small and medium). Glade Lord on forest dragon, sisters of twilight on forest dragon, Orion, waywatcher, waystrider, nomad Prince, 30 glade guard (old and new mix), 10 eternal guard, 10 wardancers, 6 bowmen on horse. I just spied Warhammer Quest in the shelf there, bravo! You must have a good percentage of the monster lists within this amazing collection. As it's about half a year ago since my first post and my collection has still grown a lot, here's an update (values are rounded to hundreds or thousands). The second number is the change since Sep 2018. @Duke of Gisoreux Wait wait wait you lost 3K points of skaven? What did the poor ratties do to earn such a harsh punishment?! No fear, I didn't loose any Skaven models. Before the release of the new Skaven Battletome I had all Skaven listed just as Skaven. Now I have only the units from the old Skaven Compendium (Skavenslaves, Chieftain with Battle Standard) and the units that didn't make it to the new Battletome (Deathrunner and Poisoned Wind Mortar Weapon Team) listed as Skaven. All units from the new Battletome are listed as Skaventide to distinguish them from each other. @Duke of Gisoreux Ahh I totally missed the Skaventide mention right below! Makes far more sense now. And yeah if you had skavenslaves I can see losing quite a chunk of models in the new tome. Though, personally, I have to say that I think its one of the few cases where an army has "lost" a model and its not been detrimental. I recall looking at Skaven years back in the Old World and the idea that one had to take hundreds of pretty much worthless slaves which basically went on the board only to die was rather offputting. Fits their lore great, but not as fun on the tabletop even though they really could swarm! I just added Karanak, 5 Flesh Hounds, 6 Skull Crushers, a Skull Canon, Bloodmaster and Skulltaker to my Khorne army. Can't forget the Alar and Judgments of Khorne! Though, sadly, I still haven't bought the Bloodthirster and really want Skarbrand now. I've also got the Fyreslayers start collecting and Warhammer Underworlds warband... I have most Underworld Warbands, even though I don't play that game. Won't count stormcast or slaves as I may well sell both of those off to get hotel sorted earlier for SCGT. Scar Vet Carnosaur with Spear. Oldblood on Foot with Spear. 70 x Skinks, boltspitters/javelins and shields. Pretty much just missing Kroak, Stegadon Flamethrowers and another 20 Saurus Warriors to field a Sunclaw. Also there are a Box of Black Guard and Idoneth Namarti Reavers lying around which I plundered for bits. If High Aelves would not be in this current state of disarray I would probably own: Swordmasters, Reavers, Bolt Throwers, High Elf Archers, Silverhelms and various Heroes. I had to promise myself, and my wife, that I wouldn't buy any more models for at least a year, which is fine. I have a lot of painting to do! 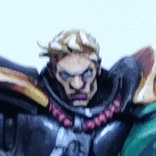 Haven't photographed it all but here is a small sample of what I've painted so far.